Roscommon and District League Round Up by Vincent Brookes. Shane Furey scores twice, Ryan Larkin displays great form with two goals as Ahascragh United share spoils with CP Ajax. 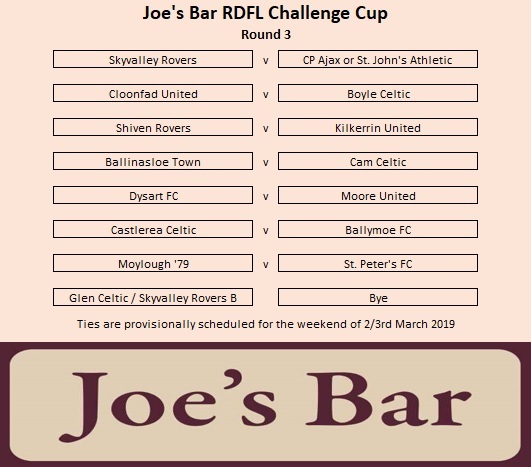 Holders St. Peter's FC will travel to Division One leaders Moylough '79 in Round 3 of the Joe's Bar sponsored RDFL Challenge Cup. Cam Celtic despatched by St. John's Athletic. This week's RDFL Lotto numbers are 6, 14, 19 & 22. There is no jackpot winner. Adam Connolly scores three times as Moylough 79 claim victory against Rahara Rovers. Moylough 79 has yet to be beaten in this competition, having won 13 out of its last 16 games. Vando has scored in the last 3 consecutive games. 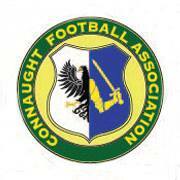 The draws have been released for the last 16 of both the TP Brennan Connacht Cup & Connacht Shield. Ballymoe F.C. despatch Skyvalley Rovers. Sean Burke scores brace as Cloonfad United B take spoils against Manor United. The fourth round of the TP Brennan Connacht Cup took centre stage on Sunday but overall it was a disappointing day for teams from the Roscommon and District League. 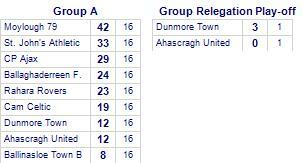 Cloonfad United beaten by Castlerea Celtic. Roscommon & District League Round Up by Vincent Brookes. Skyvalley Rovers B beat St. Cuan's United. 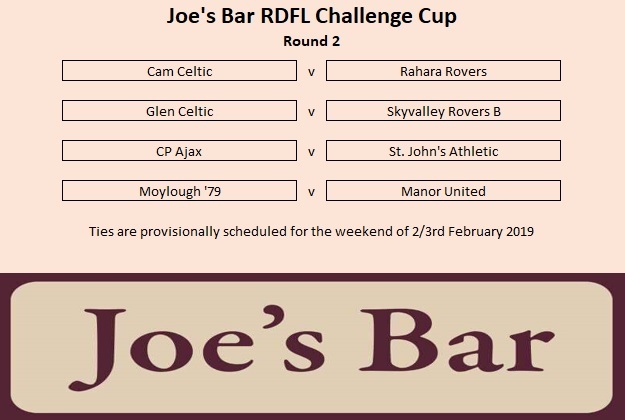 The draw for Round 2 of this season's Joe's Bar RDFL Challenge Cup has been released. 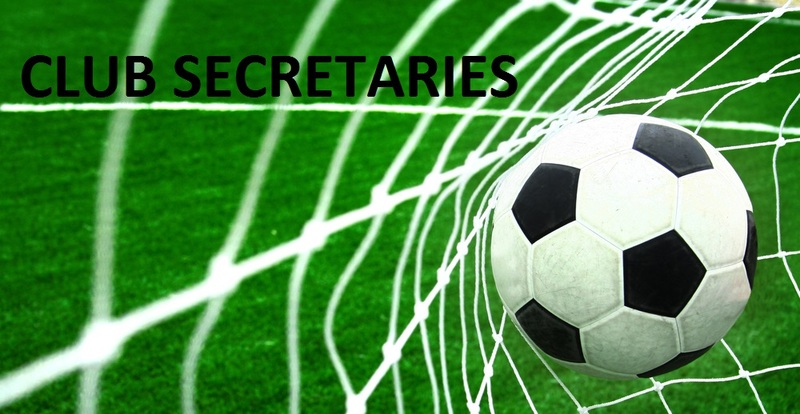 Ties are provisionally scheduled for the weekend of 2/3rd February 2019. Ryan Mc Hugh shows class with hat trick as Glen Celtic despatch Ballymoe FC B. This week's RDFL lotto numbers are 17, 21, 22 & 23. There is no jackpot winner. Kilkerrin Festival Committee, Enda Walsh c/o Kilkerrin United. 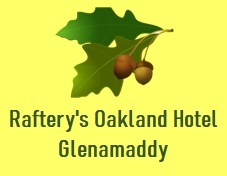 The next draw is on January 29th for a jackpot of €16,050. 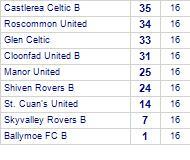 Ballymoe FC B share honours with Skyvalley Rovers B.
Ballymoe FC B has yet to win in this competition. Skyvalley Rovers B have yet to win away from home.